So I had to go to the airport again. But this time to the domestic terminal, rather than international. My assumption would be that it would be equally easy, and I set off with alacrity. However, it isn’t as easy. Or at least, if it is I haven’t found the easy way to do it. It’s a bit further, but the only route I could find basically involved riding into the airport via the main vehicle route – you know, that multi-lane entrance with gantry signs for ‘car park’, ‘departures’, ‘car hire return’ etc. And then I had to get across several of those lanes, in quite heavy traffic. 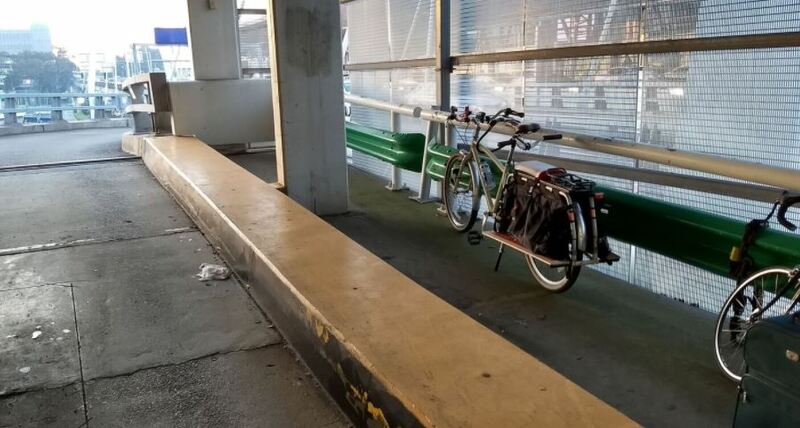 I ended up slogging my way up the ramp that leads to departures (sensing the annoyed drivers behind me, as I held them up for a few precious seconds as I ponderously pedalled my loaded cargo bike). Once I got to the departure drop-off, I then had to find somewhere to leave my bike. This I did find eventually – a spot near the motorbike parking adjacent to the car park entrance. It wasn’t a proper bike park, but there was one other bicycle there, so I hoped it would be OK. I also didn’t find any showers, although to be fair I didn’t look very hard, given it was a very chilly morning and I didn’t need one. Perhaps there are some somewhere. The ride out of the airport was equally tricky – I had to again ride out via the vehicle exits, with all the lane merges and roundabouts. Luckily my flight was one of the last to arrive in the evening, so traffic was light – I don’t think it would be so pleasant at peak time. The new look Radish is working out well. The girls love going on it, it’s easy to ride and the running boards are not just nice for little feet to rest on – they are also useful for supporting luggage and trombones. However, there is one problem. it is extremely easy, when pulling away or manoeuvring the bike, to catch the back of your ankles on the front edge of the board. 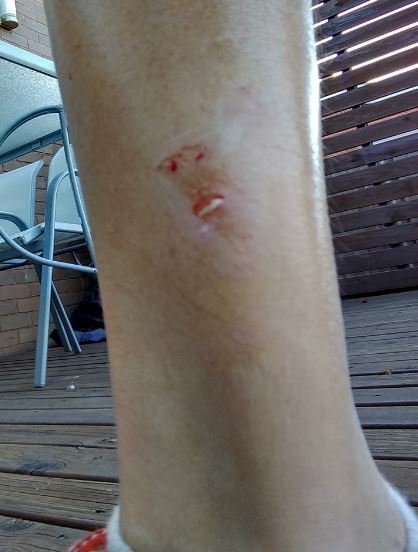 Given the board is plywood, that edge has quite some abrasive qualities. And thus I have scars forming on my legs due to the near-constant grating. I keep thinking that I’ll get used to it, and automatically start keeping my legs clear. But it doesn’t seem to be happening – the design of the boards just protrudes into a point where your legs sometimes need to be. It’s a bit irritating (and painful), to be honest. A long while ago, I read Wendy Moore’s ‘The Knife Man’, and really enjoyed it. I didn’t review it on this blog, for some reason, but anyway, it’s a good book worth reading. Remembering that book, I picked up Wendy Moore’s latest offering at the airport before a flight. It is a little similar – a medical history book. It tells the story of John Elliotson, a radical doctor working in London in the early Victorian era. Medicine was a pretty brutal business in the early 1800s, and Moore presents all the gore and terror very evocatively. Many medical procedures were basically useless, and there was little in the way of scientific examination or reflection about the causes and treatment of disease. Elliotson was one of a new breed of doctors who was more scientifically minded. He was at the forefront of a number of medical breakthroughs, including the use of the stethoscope and using quinine to treat malaria. He also became very interested in ‘Mesmerism’ – better known today as hypnotism. Initially as a way of offering both pain relief in operations and also treatment for nervous conditions, although as his research progressed he become increasingly obsessed with the more fringe elements of mesmerism, such as clairvoyance. 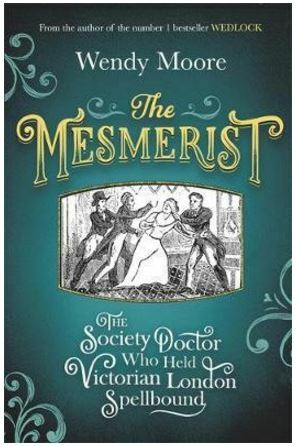 As Elliotson become increasingly obsessive, carrying more and more outlandish demonstrations of mesmerism, the medical establishment become split about the value of mesmerism, and whether it was a genuine phenomenon or merely trickery and quackery. This triggered huge infighting and recriminations across hospitals and the newly emerging medical journals such as The Lancet. At times the pace of this book flags – Moore sometimes spends too much time on descriptions of all the demonstrations of mesmerism, so the book reads in part more like a set of case descriptions. But mostly this is an easy read (if not for the squeamish! ), painting a vivid picture of the state of medicine at the time, and how new ideas were both embraced and rejected. This ability to make serious historical scholarship accessible and ‘novelistic’ is Wendy Moore’s great strength. A fascinating book. Sorry it’s taken me so long to get to these. I’m not quite sure why it took so long; I think I bought some to review, and then left them at work. They then got eaten before I could try them, and I forgot to get any more. Anyway, here they are – the ‘Messina’ flavour Salted Caramel and Vanilla. 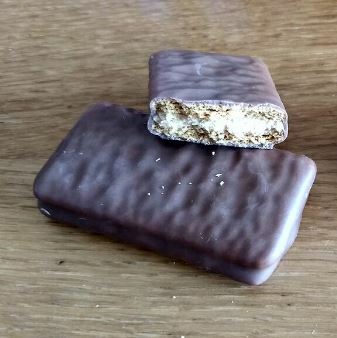 This is not the first Salted Caramel Tim Tam. And certainly not the first salted caramel biscuit from Arnott’s. So how does this incarnation stack up? Well, the biscuit part of them is a rather strange orange colour, with a darker orange creme inside. They smell sort of cloying – so not a great start. Unfortunately, they don’t taste great either. Very sweet, with hardly any salt, and with a distinctive cardboard taste. You know that taste you get from old ice-cream – the kind that comes in a cardboard box – when it’s been in the freezer a bit too long, and you get the bit from the last edge? Well, they taste kind of like that. Which I suppose captures the ice-cream vibe in one way, but I can’t help feeling Arnott’s were going for something a bit more classy than that. This whole Messina thing to me has not been a huge success. I might humbly suggest it’s time for a re-think, Arnott’s? I’m going to give these three out of ten.